You can already build very detailed bottoms-up revenue models in Jirav and now we have made it even easier. The new global products list can be shared across all your plans in addition to the plan-specific products you can already make. These global products can be defined with a lot of customization around revenue recognition, billing schedules, delays and revenue account mappings. 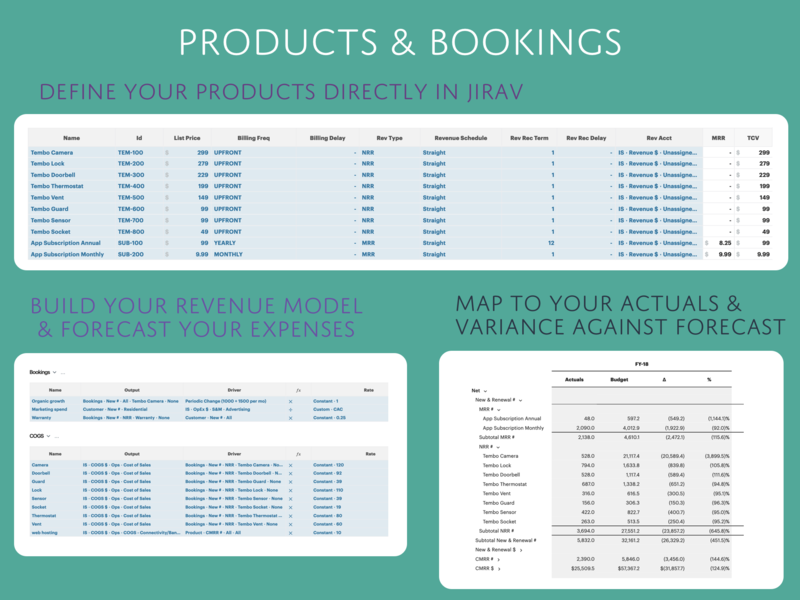 Jirav's revenue recognition engine takes care of the AR and other balance sheet impacts. Within your forecast, these products become the building block for the revenue model assumptions, as well as assumptions on COGS, OpEx, Staffing etc. These products can then be mapped to your actual customer backlog letting you variance against your forecast with full product and booking level granularity, in addition to its effects on Revenue, Expenses, Balance Sheet and even Headcount.